The Woolmark brand is the world’s best-known textile fibre brand and is owned by The Woolmark Company, the world’s leading wool textile organization. The value of the brand is well established and highly regarded across the world in the apparel, interior textiles and home laundry sectors. To learn more about the company and brand, go here. The Wool Lab, a seasonal guide to the most inspiring wool trends and best products, is created to inspire and inform fashion professionals regarding the infinite potential of Merino wool. 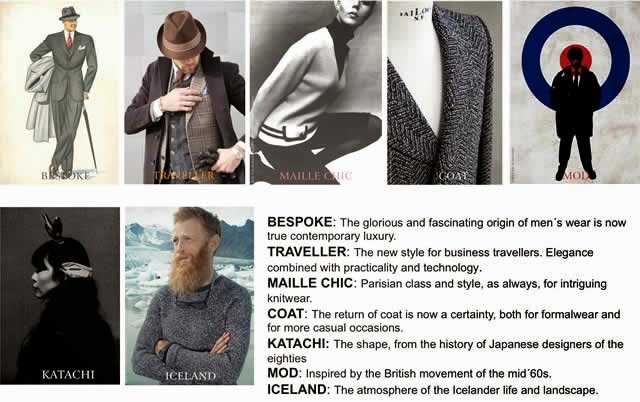 A trendbook and a sourcing guide, the tool is the result of extensive research undertaken by The Woolmark Company through its global network to select the best wool products worldwide and identify the emerging trends emerging from fashion, design, art, pop culture, music and other fields. The Wool Lab is created each season in collaboration with the world’s most innovative and quality-oriented spinners and weavers. It is a collection of the most beautiful wool products, commercially available, and in line with the leading fashion and textile trends. Below is a preview of their Fall/Winter 2015-16 trends. You can order the entire seven inspirational themes here for both Womens and Mens.